So sweet & comfy for your little sleeping beauty! *price includes bulky/handling fe.. Even the cutest among us need our beauty rest! *price includes bulky/heavy handling cha..
Help bring out your fur baby's wild side in this gorgeous luxury bed! *price includ.. 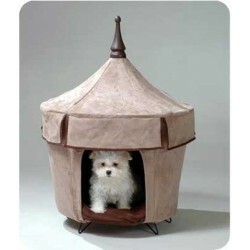 This ADORABLE tent bed is made of white nylon fabric and features a billowing eave of the same mater..